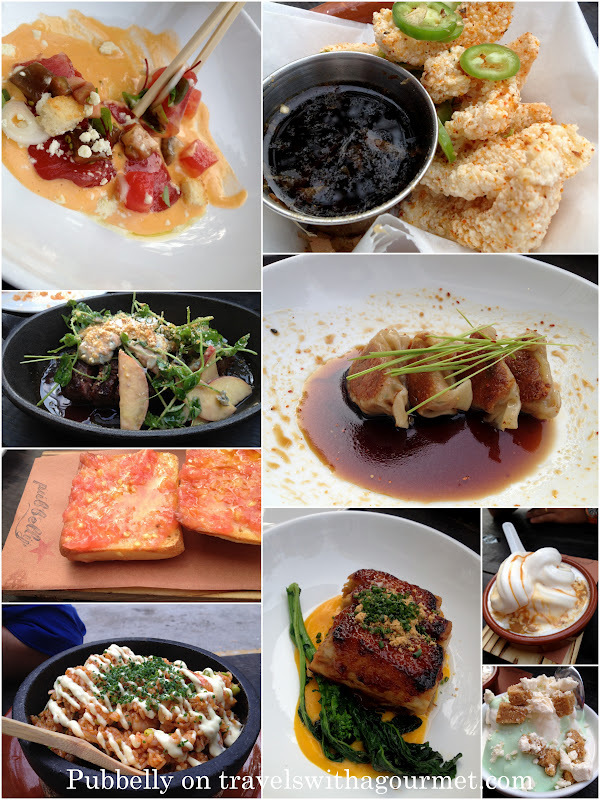 On our last Saturday evening in Miami, I had scheduled for us to have dinner at Pubbelly, one of the Miami beach’s foodie musts. Opened by three friends, two of them Puerto Ricans and one Spanish, this “gastropub” has been the go-to place for both Miami beach residents and visiting foodies. I had heard about the “Pubbelly boys” and their growing empire of small restaurants which started with Pubbelly then Pubbelly Sushi (right next door) plus another two – a newish tapas restaurant, Barceloneta, and their latest addition, the Italian, Macchialina. All four are within the same area and almost within walking distance of each other and all are small enough for them to refuse reservations and just rely on a steady stream of walk-in guests from the neighborhood. Since no reservations are taken at Pubbelly, we made sure to arrive at 6:30 (they open at 6:00) and thought we would easily snag one of the indoor tables but the place was packed and there was already a half hour wait so we settled for one of the two counter-style communal tables outside, each with 6 stools. We three sat at one table, while another group was in the other, halfway through their dinner. Service was quick and drinks orders were taken and menus given, as soon as we sat down. Pubbelly’s menu is made up of share plates of Asian-inspired tapas with a bit of French, Spanish and Italian influences thrown into the mix. The ingredients origins are stated on the menu, sort of like a pedigree, so you know where every morsel you eat came from. The food is meant to be shared and come in small portions, so dinner consists of many different plates set in the middle of the table “family-style”. There is also an extensive beverage menu with many beers on tap, wines and even sakes. We were quite hungry after a long afternoon at the beach and started to pick out several items from the menu – the signature pork belly with kabocha, butterscotch miso and corn powder, salt and pepper squid with smoked soy, serrano, schichimi (Japanese 7-flavor chili pepper) and crispy garlic, the classic Catalan pan con tomate, tuna crudo and the butcher steak – sliced hanger steak. From the dumplings, we chose pork and scallion with shoyu, schichimi and onion marmalade and from the noodles and rice, we went for the spicy Kimchee fried rice with seafood aioli (another version is with pork belly and pineapple). The food came fast and one after another so our table started to fill up. The tuna crudo was cold raw tuna chunks tossed in a dressing with watermelon pieces – a refreshingly spicy combination. The steak, thinly-sliced and served with pear slices and crumbled Cabrales (Spanish blue cheese). The pan con tomate was the only classic dish we had – crusty bread rubbed with fresh tomato and drizzled with peppery E.V.O.O. The pork belly lived up to its’ reputation – a roasted melt-in-the-mouth pork belly chunk, slathered with sweet miso and served over wilted chinese greens. The dumplings were delicious too and the kimchi fried rice was a shot of seafood and spice to accompany the rest of the dishes. Only the salt and pepper squid was disappointing – dry and overcooked making the squid hard to chew. For dessert, we shared the bread pudding and the frozen key lime pie, both of which came with fat-free frozen yoghurt and ended our gastropub experience on a sweet note. Dinner at Pubbelly was a pleasure. I look forward to my next Miami visit and to try the rest of the Pubbelly boys gastronomic creations. *Open for dinner from 6:00 p.m. till midnight on Tuesdays to Thursdays and from 6:00 p.m. till 1 a.m. on Fridays and Saturdays. Closed Mondays.